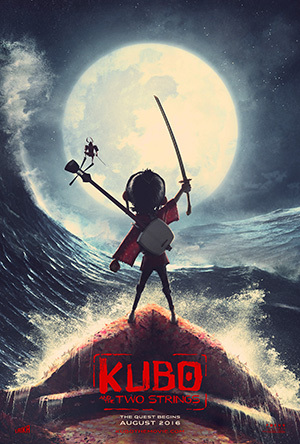 I finally caught up with Kubo and the Two Strings during the Labor Day weekend; I wish I had seen it earlier and in the 3-D version. The 2-D version is spectacular, but I suspect the added depth of 3-D would be impressive. It is an American film, but it closely resembles the few Japanese anime films I have seen. The animation is very good, and the voices are provided by some very good actors, including, but not limited to, Ralph Fiennes, George Takei, and Charlize Theron. The plot shows a deep influence from the Harry Potter books and movies; a young boy with unusual talents has lost his parents as well as one of his eyes and goes on a quest to find the truth. His talents include bringing to life the origami he shapes from a seemingly endless supply of paper. He is aided and protected by a monkey and a cockroach-samurai, but he eventually faces his worst enemy alone.